However, it is vital to know the range of rates and prices that local programmers charge before starting the candidate search so that the recruitment process ends quickly and productively. In this article, expert recruiters of Qubit Labs provide a detailed review of what it takes to hire a Ukrainian developer, what models of recruitment are possible, and explain the Ukrainian outsourcing rates considering the project types, the developer’s tech stack, and other variables. Before we proceed to analysis of IT salaries in Ukraine, it’s important to take a firm grasp of what type of hiring you plan – whether the recruitment will be done on your own or with the help of a staffing vendor. Each of the methods has its pros and cons – here are most important ones. If you are hiring a developer directly via a freelance platform (like Upwork, Freelancer, etc. )., the payment you will provide to a Ukrainian coder is mostly likely to be calculated per hour. Hourly rates are traditionally higher than a fixed salary for the project or per month (and don’t forget about the platform’s commission). Once you hire programmers directly through recruitment websites, then you’ll pay a monthly rate for the agreed amount of work. The latter option is surely better in terms of cost savings. Hiring with the help of a vendor may also be priced differently – per hour and per month. Hourly rate is not recommended as each hour you pay for the coder’s work includes the vendor’s service fee. Thus, the more hours they work for you, the higher your commission is. Another option is the IT staffing cost presupposing a monthly salary to the developer and a fixed vendor service fee. It is paid to a programmer hired directly by the client. The major benefits of this model are its transparency, absence of hidden fees and costs. It’s ideal for short-term projects and startups, as the costs are kept at minimum. However, it’s not convenient for clients who don’t want to mess with salary payouts. Such international payments take time and require much documentation, which gets extremely tiresome in case you have no accountant. Outsourcing companies with working teams usually work on a project basis, and the client pays for the developers’ work per hour. Hourly outsourcing rates in Ukraine include the programmer’s salary and the vendor’s commission, while the exact ratio of coder-vendor payment is usually not clarified. 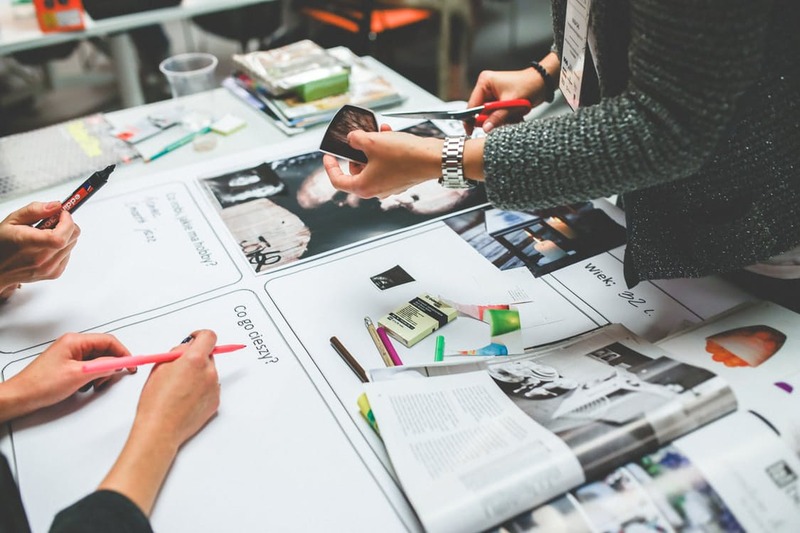 However, this model still has advantages for the client: instead of hiring only people for the work, the client gets an office in which they work, payment of their employment taxes and other maintenance costs as a service package. Thus, the model is convenient for short-term projects or non-core project aspects; such jobs rarely require hiring a person in-house to fire him/her soon afterwards. But for long-term projects, such pricing model is too costly. This pricing model is the most transparent one; moreover, it combines the pluses of the two aforementioned models. The client knows exactly how much the programmer is paid and how much the vendor charges for the staffing services. Speaking about Ukrainian vendor rates, the fee may vary from $700 to $3,000 depending on the rendered services. Nevertheless, in some cases, the difference between services for $1,000 and $3,000 is insignificant, so we recommend studying the market first and finding a reliable vendor charging a reasonable fee for a broad spectrum of services. Now that we are clear about what the client pays for when hiring a coder in Ukraine, it’s time to clarify the actual average software engineer salary here. Developers with a junior level of proficiency in React/JS charge $500-1,000 per month for their work. A middle-level expert in this field may cost you around $1,500-2,800, whole senior-level work is priced $3,000-5,000 per month. Junior-level programmers specializing in ASP.NET currently charge from $800 to $1,200 per month of their work in Ukraine, while middle-level rates reach $2,000-$3,000 per month. 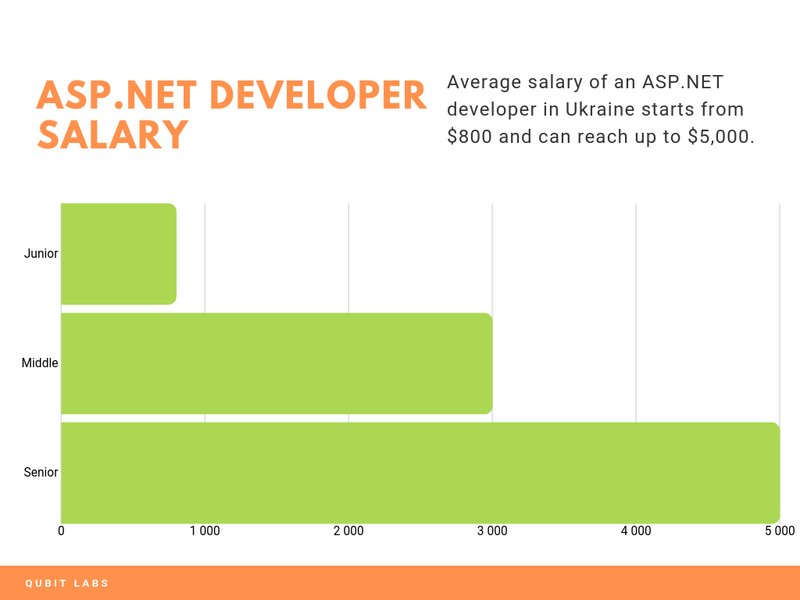 If you need a senior-level expert for an ASP.NET project, be ready to spend $3,500-$5,000 per month. 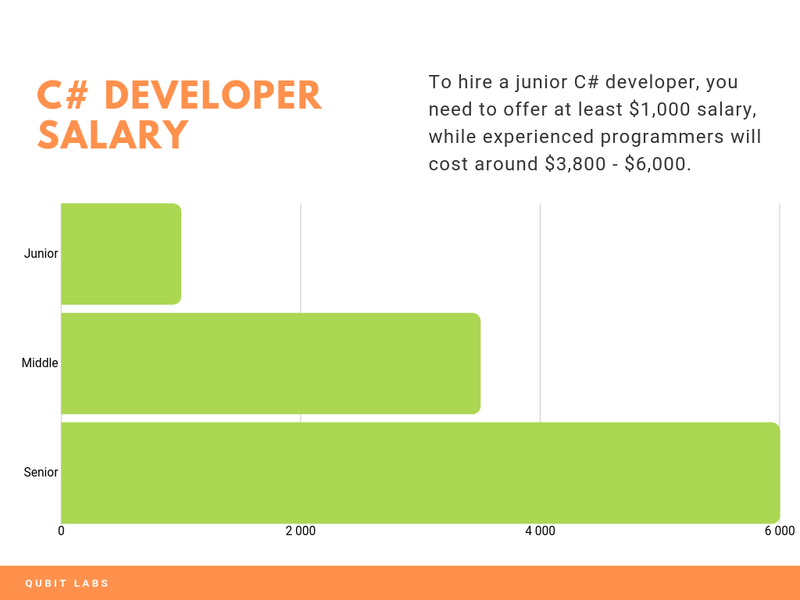 In Kyiv, a junior C# developer receives on average $1,000-$1,500 per month, while in Odesa, they receive around $900 per month. In Kharkiv, specialists of this level charge $950 per month on average, and in Lviv, the rates range within $980 in Lviv. Middle-level C# developers charge $2,000-3,500 in Kyiv, $2,000 in Odesa, $1,950 in Kharkiv, and $2,200 in Lviv. When it comes to senior-level coders, clients should be ready to pay $3,800-6,000 to candidates in Kyiv, $3,468 in Odesa, and $3,600 in Lviv. Junior C++ developers charge $800-$1,200 in Kyiv, $900 in Kharkiv, with developers in Odesa and Lviv charging less on average. Middle-level coders will cost a company $2,000-2,800 when hiring in Kyiv, $2,000 is the candidate in Kharkiv. As for senior-level specialists, they charge up to $3,000-5,000 in Kyiv and $3,500-5,000 in Kharkiv. DevOps is the specialization enjoying increasing popularity; Ukrainian beginners in this professional area charge $900-$1,300 for their services, while middle-level talent already costs $1,500-2,500 per month. In case you need a seasoned senior-level professional to the team, he/she is likely to charge around $3,000-5,000 per month. 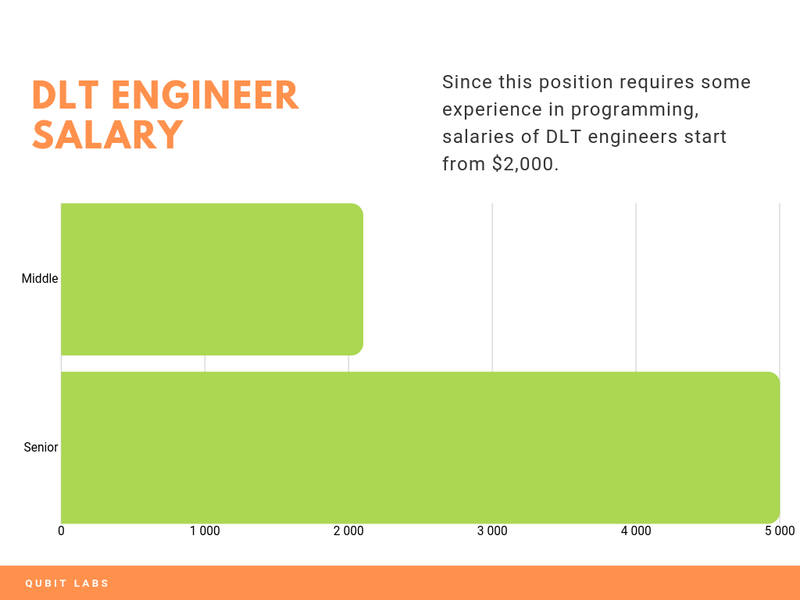 A demanded profession now, DLT development costs a pretty penny. While no data is available for junior-level coders, middle-level blockchain specialists charge $2,000-3,000 on average, while senior-level experts may cost your company around $4,000-6,000 per month (data relevant for Kyiv). 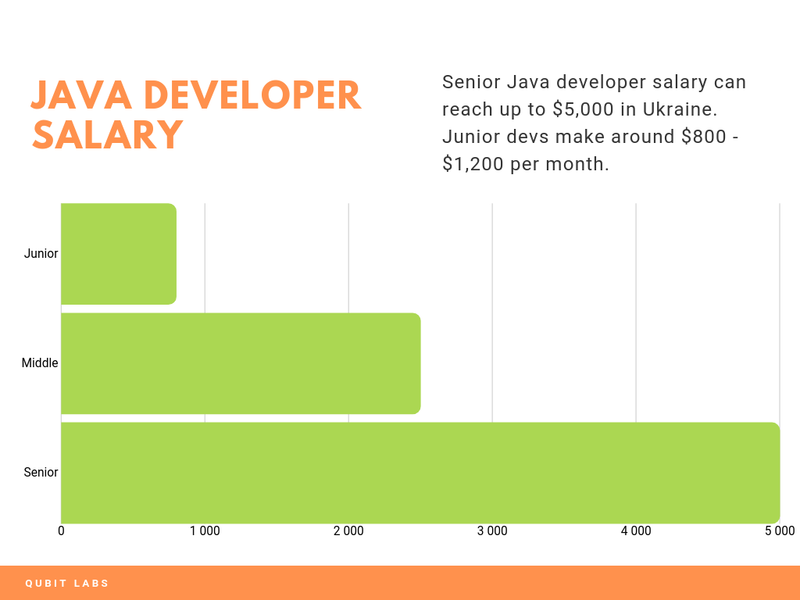 Junior Java developers charge $800-1,200 in Kyiv, $725 in Lviv, and $755 in Kharkiv. Middle-level experts in Java may cost your company $2,000-$2,800 in Kyiv, $1,925 in Kharkiv, and $2,100 in Lviv. Senior-level expertise in Java development raises the rate of developers to $3,000-5,000 in Kyiv, $3,100 in Kharkiv, and $4,000 in Lviv. 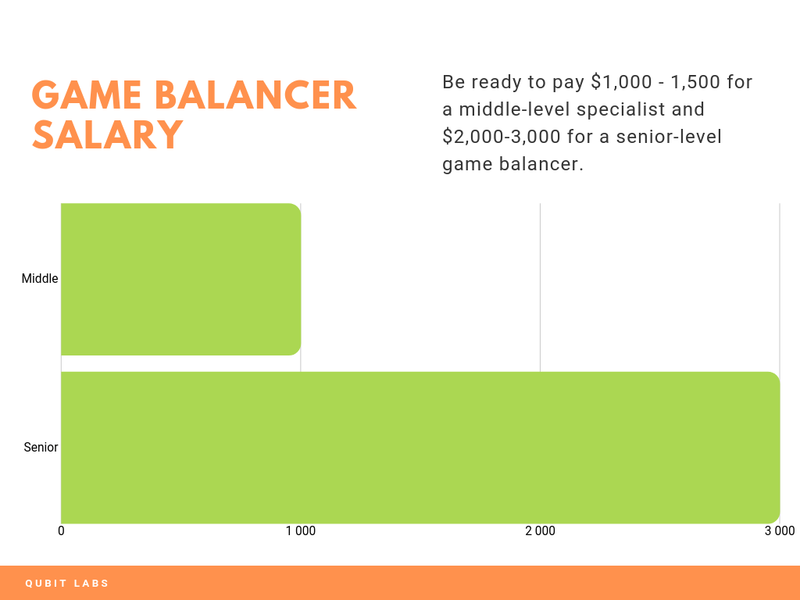 If you are in need of game balancers, be ready to pay $1,000-1,500 for a middle-level specialist and $2,000-3,000 for a senior-level expert in your team. 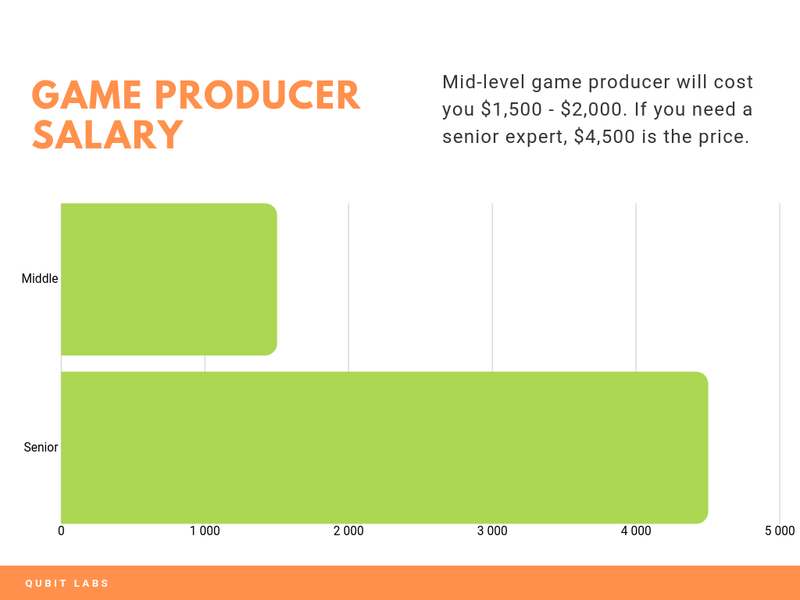 Game producers of middle level charge the rate of $1,500-2,000 per month, while senior-level producers are available for $3,000-4,500 per month. Mobile development for Android and iOS is generally charged on an equal rate in Kyiv. Here, you can hire a junior developer for $500-900 a month, while middle-level experts may cost you $1,200-2,000. 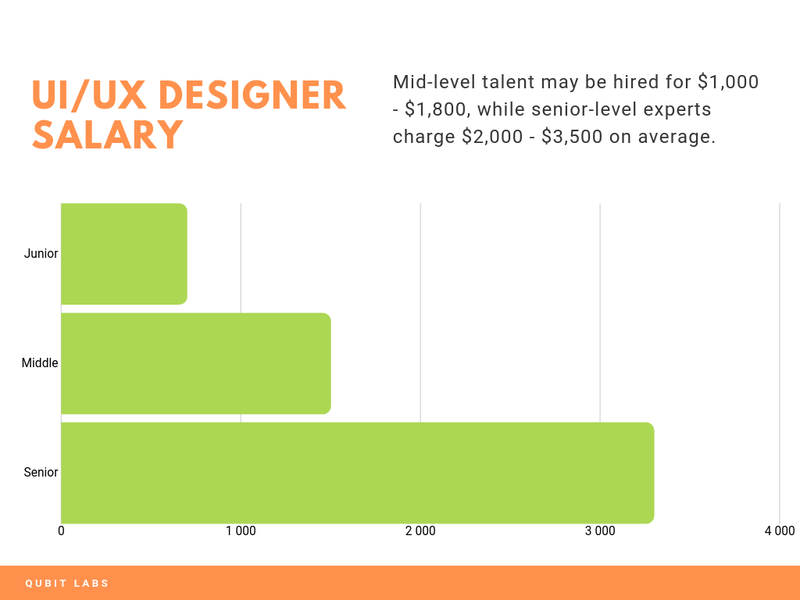 Senior-level programmers in this field charge $2,500-3,500 on average for their services. 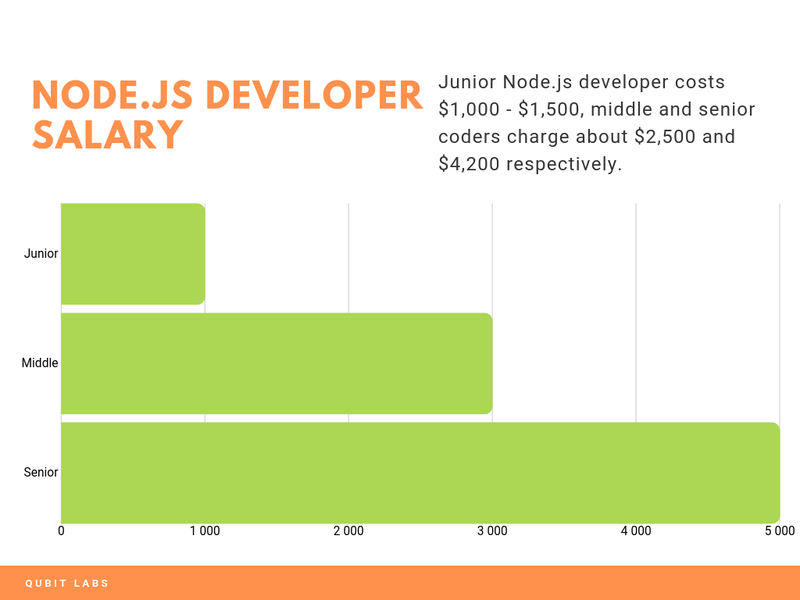 The rates of junior-level Node.js coders in Ukraine generally range from $1,000 to $1,500, while middle-level experts charge higher, $2,000-3,000 per month on average. Senior-level talent may cost your company around $3,500-5,000 per month. 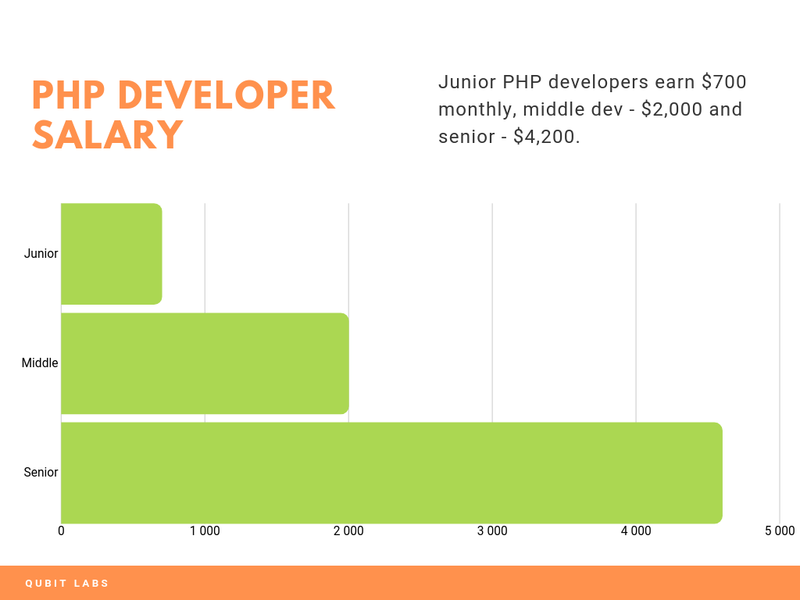 PHP developers’ rates range from $500-1,000 for a junior-level project to $1,500-2,500 for middle-level specialists and $3,000-5,000 for senior-level experts. The pricing for services of Python developers is generally in line with that of PHP coders. Junior-level specialists charge around $500-1,000 for their services, and middle-level coders want $1,200-2,500 for their monthly work. A senior-level Python developer will cost your business $3,000 at minimum, while some professionals charge up to $5,000 per month. QA jobs differ by auto and manual tasks. A junior Automation QA charges $1,000-$1,500, while a QA specialist of the same level for manual tasks rates the work at $400-800 per month. Middle-level Automation QA testers charge $2,000-2,500, and manual QA of senior level may cost you around $1,000-2,000. Senior-level QA testers charge $3,000-4,500 for auto work and $2,500-3,000 for manual testing. The statistics are relevant for Kyiv, while in other tech hubs in Ukraine, rates may be slightly lower. 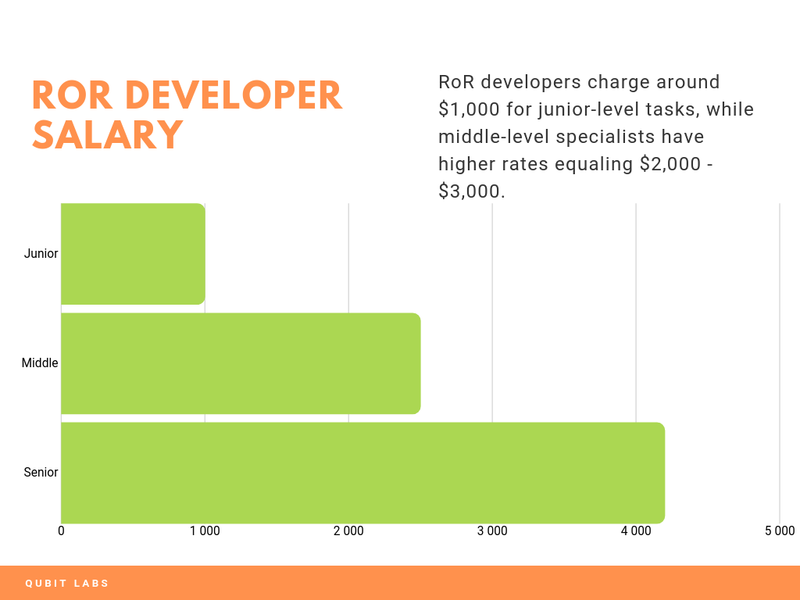 RoR developers charge $800-1,500 for junior-level tasks, while middle-level specialists have higher rates equaling $2,000-3,000. The senior-level RoR specialist may cost your company $3,500-4,500. Scala development is also priced in accordance with three levels: junior-level work may cost $1,000-1,500 per month; middle-level work is rated $2,000-3,500 per month, and senior-level specialists usually charge around $3,800-6,000. The junior-level UI/UI designers in Ukraine currently offer their services at the rate of $500-900 per month. Mid-level talent may be hired for $1,000-1,800, while senior-level experts charge $2,000-3,500 on average. Unity developers of junior level price their work at $500-900 per month, while middle-level workers rate their work at $1,500-2,000 per month. Monthly salaries for senior-level experts with the knowledge of Unity range from $2,500 to $4,000 per month in Kyiv. Though the data is research-based, please note that the indicated figures are net salaries, and they may vary within a reasonable range depending on the region, tech stack, and other individual characteristics of coders for hire. We understand the expertise that a coder possesses in terms of programming languages, frameworks, and tools when speaking about his/her tech stack. For instance, you are looking for a coder with a solid background in CSS and HTML who is able to code in JS and C++. Some popular tech stacks are MEAN (including MongoDB, Express, Angular, and Node.js), LAMP (Linux, Apache, MySQL, and PHP) and MAMP (macOS, Apache, MySQL, PHP/Perl/Python). Junior developer: a candidate with 0-2 years of experience (usually inexperienced, probably a graduate from college or working on his/her first software development projects). Middle Developer: a candidate with 2-5 years of experience (can operate independently and solve targeted technical problems, possessing strengths in one or more technical areas). Senior developer: a candidate with 5+ years of experience (an experienced professional with a strategic, lean approach to software development and problem-solving). Overall, IT salaries in Ukrainian cities don’t differ profoundly, and you won’t save much by looking for a coder in a smaller city. Besides, it may be challenging to find a reliable staffing vendor in small cities; that’s why it is more appropriate to focus on major IT hubs such as Kyiv, Lviv, Kharkiv, and Odesa. Kyiv is the Ukrainian capital, so foreign clients find it most convenient to hire programmers here. The supply of staffing vendors and talented programmers is abundant, new modern technologies are quickly adopted by specialists, and arrangement of business trips to Kyiv is very simple. For these reasons, it’s very easy to close the vacancies quickly and within the budget. Only within a couple of decades, Lviv has also developed as one of the Ukrainian tech hubs with over 200 tech companies and over 20,000 developers now offering their services here. The second largest Ukrainian city and the educational hub in Ukraine, Kharkiv boasts a vibrant tech community. Numerous higher educational establishments provide modern, competitive education; multiple specialized conferences take place here; and 6 IT outsourcing companies with 400+ employees offer their services there. Odesa is a southern city boasting the presence of over 74 large IT companies, R&D centers, startups, and other providers of related services. As of today, over 8,000 specialists are employed in home and outsourced development projects, which constitutes around 5.5% of Ukrainian labor force. The number constantly changes with 1,000 new tech graduates entering the IT field every year. So, how much does a software engineer make in Ukraine with the aforementioned variables in mind? Here is the detailed breakdown by technology, city, and seniority level. Ukrainian outsourcing rates are presented as hourly rates because of the hiring model’s peculiarities. As we mentioned it above, the present model is suitable for short-term projects that are calculated with an average estimate of 21 working day (168 hours) a month. The information in the table below is based on the rates provided on Upwork. As one can see, the salaries differ profoundly depending on the experience and project requirements. For instance, a DLT developer may cost your business from $20 to $120. An average rate of a lead or senior developer in this area is $45 per hour, but if you are looking for an advanced professional with 10+ years of expertise, then be ready to double the rate. 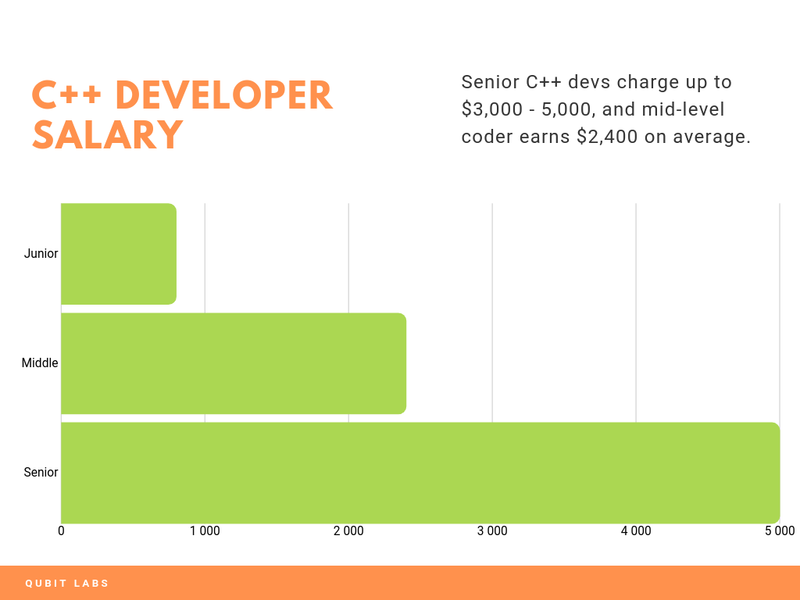 C# developers typically charge from $15 to $50 per hour, while C++ developers may cost your business more – $10-100 depending on the project’s complexity and the candidate’s professional record ($10 is the typical rate of beginners, while middle-level coders typically charge $40-60 and senior programmers may increase rates up to $100). 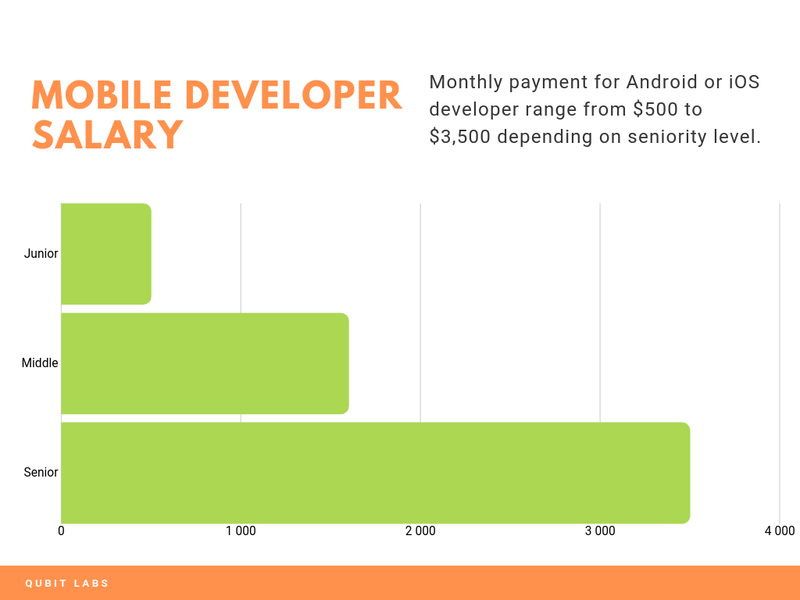 The rates of Java programmers and Mobile developers (Android/iOS) are generally within the same range – starting from $20-25 per hour and stretching up to $65-70. 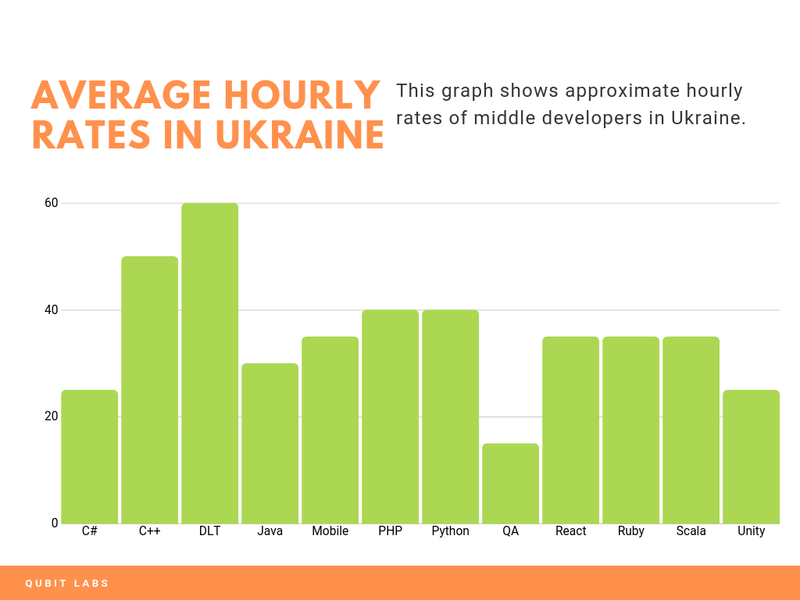 PHP and Python developers in Ukraine charge $20-80 on average, while QA engineers’ rates are much lower: $13-30 per hour. If you need a React/Angular, ROR, or Scala developer, be ready to pay around $25-70 per hour. Unity developers in Ukraine currently charge around $15-45 per hour of their work. Here’s a snapshot of IT salaries in Ukraine, with a detailed breakdown of Ukrainian software developer rates by seniority, location, and technology required by the employer. Study this data carefully, analyze your project needs, and start the hiring process with these peculiarities in mind. If you find it cumbersome or hard to conduct direct hire, contact the managers of Qubit Labs for a quick, affordable, and effective candidate search based on your project requirements. Elena is a recruiter and head hunter with experience in providing full cycle of recruiting process, managing candidates pipelines, creating and executing multichannel sourcing strategy to find candidates meeting client’s needs.